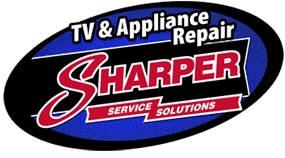 Sharper Service Solutions charges a $89.95 service call charge for in-home appliance service ($79.95 for TV) that is not under warranty or covered by a service contract. This charge will get the technician to your house to evaluate, troubleshoot and diagnose your TV or appliance. Once the diagnosis is complete, the technician will then provide you with an estimated cost of the repair. The service call charge will apply towards the repair cost. To determine your repair cost, we use the nationally recognized Appliance Blue Book which provides flat-rate repair pricing and keeps our costs extremely competitive with other repair providers. We no longer provide carry-in service.